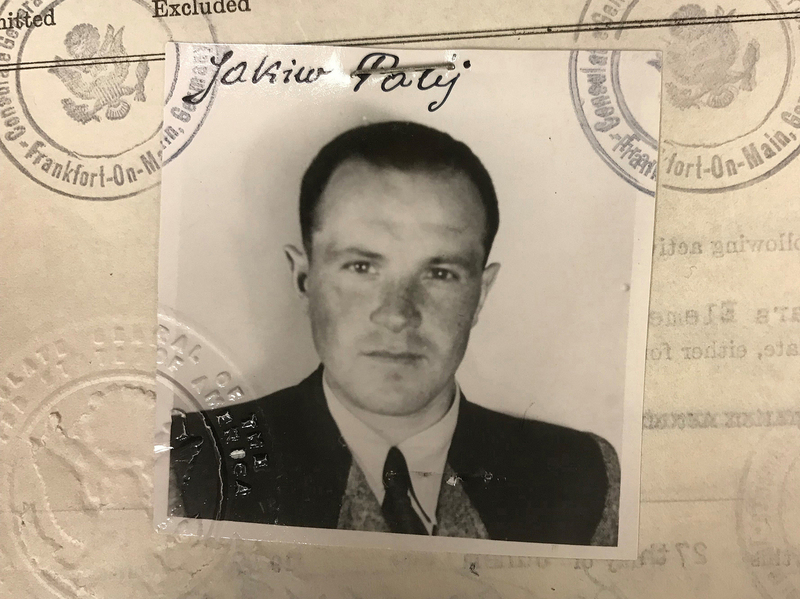 Last Known WWII Nazi Living In U.S., Deported To Germany Last Year, Is Dead at 95 The United States stripped Jakiw Palij of his citizenship in 2003, but it was difficult finding a country to take him. He was never charged for his involvement in the Holocaust. Jakiw Palij, a former Nazi concentration camp guard, immigrated to America in 1949, claiming he had worked on his father's farm during World War II. A Nazi war criminal, living safely in the United States until his deportation to Germany last year, has died. He had been the last known World War II Nazi living in the U.S.
Jakiw Palij immigrated to America in 1949, claiming he had worked on his father's farm during World War II. But a Justice Department investigation, based on evidence compiled by a senior historian at the U.S. Holocaust Memorial Museum, found that Palij served as an armed guard of civilian prisoners at a forced-labor camp for Jews at the Trawniki camp in Nazi Germany-occupied Poland. That's where Nazi SS troops were trained to kill Polish Jews. A federal judge stripped Jakiw Palij of his citizenship in 2003, finding that he had lied when he came to the U.S. He was ordered deported in 2004, but no country would take him until Germany finally relented last year. This week, at the age of 95, Palij died. He was never charged for his involvement in the Holocaust. "An evil man has passed away," Rabbi Zev Meir Friedman told The Associated Press. "That, I guess, is a positive." Friedman had led multiple student protests in front of Palij's home in the Queens borough of New York City. former Nazi prison guard Jakiw Palij has died in Germany. I am so thankful to @realDonaldTrump for making the case a priority. Removing the former Nazi prison guard from the US was something multiple Presidents just talked about - but President Trump made it happen. It had looked as though the aging Palij would die in the U.S., CNN reported in 2016. But there was continued lawmaker interest in deporting the war criminal. A bipartisan group of New York's congressional delegation wrote to then-Secretary of State Rex Tillerson in 2017, urging him to make the matter a priority. Palij's continued residence in New York was a "painful reminder for Americans who fought against the Nazis or lost loved ones in the Holocaust," said the letter, signed by 21 members of Congress. "We are deeply concerned that the deportation of Mr. Palij is stalled and urge your personal intervention on the matter." President Trump told Fox News last year he made the deportation of Palij a priority after many presidents had not. "From the beginning of the campaign, they tell me about this Nazi who lived in Queens, who walks the street like he owns the place," Trump said. "The Obama administration was unable to pull it off," Trump said of the deportation. "And, frankly, the Bush administration was unable to pull it off. And I was able to pull it off." The U.S. ambassador to Germany, Richard Grenell, said he had raised the question of Palij's deportation in every meeting with German officials, based in part on the urging of the president, NPR reported. With a new government installed in Berlin, there was "new energy" for negotiations, he said. Germany agreed to accept Palij in August. That month, federal immigration agents carried Palij out of his home on a stretcher, into an ambulance and onto a plane. "Palij's removal sends a strong message: The United States will not tolerate those who facilitated Nazi crimes and other human rights violations, and they will not find a safe haven on American soil," press secretary Sarah Sanders said in August. More than 70 years since the war ended, the pain of Nazi atrocities still reverberates around the globe. On Friday, German Chancellor Angela Merkel apologized to Greek President Prokopis Pavlopoulos for the damage inflicted on Greece by Hitler's forces. "We are aware of our historical responsibility," said Merkel. "We know how much suffering Germany caused Greece during the era of National Socialism." But German authorities never charged Palij for his involvement in the atrocities of Trawniki. Jens Rommel, the head of the Central Office for the Investigation of National Socialist Crimes, told reporters that there wasn't enough evidence to prosecute him. "There is no investigation into him in Germany, which means there is no arrest warrant, and as a result, it is not very likely that he will ever be convicted," Rommel told the broadcaster Deutsche Welle last year. A student from the Orthodox Jewish Rambam Mesivta high school protests across the street from the house of former Nazi concentration camp guard Jakiw Palij in 2017. "The difficulty lies not so much in describing the murders, the individual massacres, the functions of those at a camp, but in determining the individual's responsibility," Rommel said. "By what action, by carrying out what duty, by what function did the individual facilitate this murder? That is what we have to prove. And with mobile units, which some of these Trawniki men were in, that's extremely difficult." New York lawmaker Dov Hikind, who had fought for the deportation, told the AP that Palij's death brings "the closure survivors of the Holocaust needed." German prosecutors have intensified their hunt for the last remaining Nazis before they die of old age, USA Today reported last year. Nazi hunters estimated that dozens of Nazis could still be alive. In an earlier version of this story, Poland was identified as the location of the Trawniki camp during WWII, but it was Nazi Germany-occupied Poland.